Bella Is A Toy Hog! 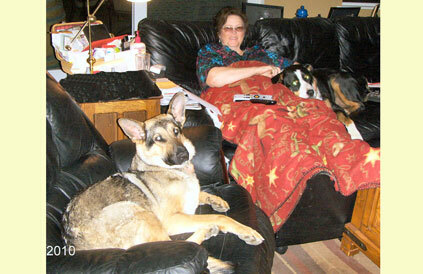 We lost our 13 year old shepard and the 14 year old Swiss Mtn dog in the past 12 months. We are so glad we brought Bella home. She is doing great! Her coat is glossy now and she pretty much rules the roost. Our 110 lb Swiss Mtn dog does not know what happened but he knows he is not in charge. Notice she has all the dog toys stacked on her pillow. Bella did this Rattlesnake Avoidance training last June and in January it saved her life when she found a baby rattler on our walkway. Her training kept her a good distance from the snake while barking to alert us. Please share the email about the Rattlesnake Avoidance clinic with everyone you know that has a dog. Thanks!